Neighbourhubs are structures located in public parks in every neighbourhood, within a ten minute walk of all residences. They offer the opportunity for residents to generate their own energy and water for daily use and during disaster situations - all while being independent of the City’s existing infrastructure. The structure appears as public art that provides light and shelter on a rainy day. Upon further inspection, instructions explain the purpose of the Neighbourhub and reveal its interactivity. The design plays on Vancouver’s strengths. 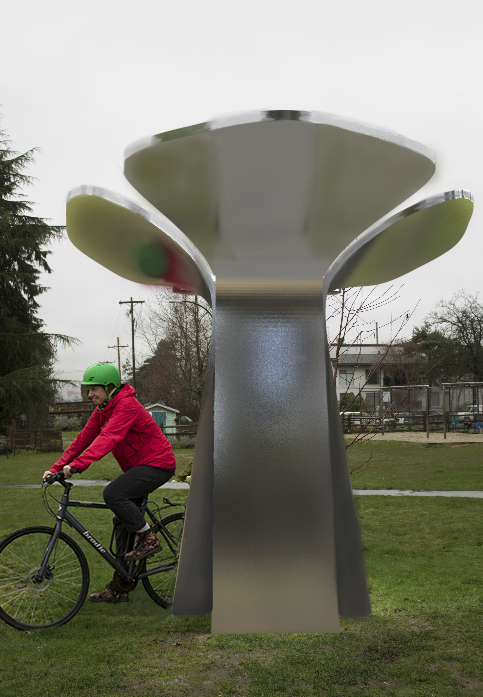 Four pedal charging stations allow users to back their bike into the structure to generate power. LED lights glow to indicate how many Watts of energy are being generated by the user, and possibly the friends or neighbours racing beside them. Power is stored within batteries to charge cell phones and the embedded radio. 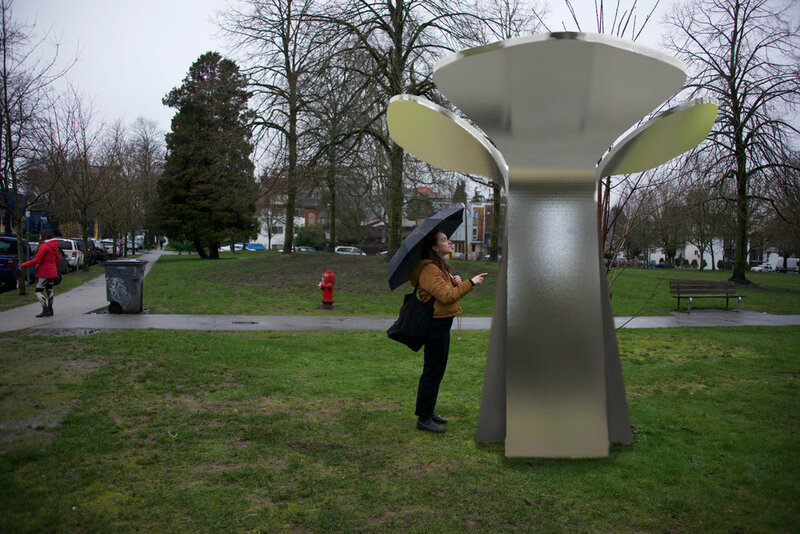 Vancouver’s abundance of fresh, drinkable water in the form of rain, is captured in a 1500 gallon cistern and filtered to meet municipal regulations. Residents can fill their water bottles, and watch the water collection gauge move, giving them a sense of water availability. Our interdisciplinary team has approached the Neighbourhub project by identifying local assets across sectors that could inform our design. We defined resilience as a population’s ability to develop regenerative solutions to challenges, being both structurally adaptable and socially responsive (Nirupama, Popper & Quirke, 2015). In particular, we understand that Vancouver requires stronger social support networks to ensure the population’s wellbeing when other systems fail. It is anticipated that preceding a natural disaster Vancouver will be left with limited, if any, access to clean drinking water or power for what could be months (Wagstaff, 2016). It was made apparent to us that Vancouver needs a way to stock up on the resources that could be lost, and most importantly start the conversation around preparedness (Katie McPherson & Katia Tynan, Personal Communication, November 2017). We hope to propose potential options for implementation that fit within the City of Vancouver’s existing disaster planning framework. We hope – more purposeful than any of the physical resources that Neighbourhub provides – that this structure will prompt conversations among community members as people learn about its capacity, and start to think about individual steps they can take at the personal and neighbourhood level to plan for emergency preparedness. Neighbourhub will be a replicable model for facilitating discussions around social connection, civic engagement and preparedness for citizens to overcome diverse threats, such as social isolation and/or exclusion, climate change, drought, and earthquakes, both today and tomorrow.